Some things are always bad. Murder or evil, for instance, are by their very nature bad. Things that are universally good are a little harder to find, but they still exist, like bacon. One would imagine then that anything not definitively bad or good could go either way. Curiously, this isn’t the case. Some completely innocuous words always get a bad wrap for no obvious reason, while others are likewise purely and exclusively positive. Let’s investigate, shall we? 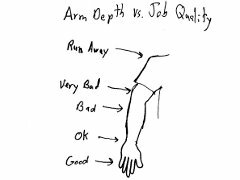 The discussion began when, after digging into a particularly awful assignment at work, I referred to myself as being “elbow deep” in it. Before I even started to complain about it, the poor sucker listening to me already knew that I was not happy. Why? Because you are never elbow deep in something good. Think about it. With the exception of the dubious claims made by the emails that slip past my spam filter, most of the things available in quantities or capacities sufficient to allow the insertion of an arm are highly unpleasant. Elbow deep in marshmallows? Not likely. Elbow deep in cash? You wish. The only person I know who is routinely elbow deep in anything is a farmer, and he’s elbow deep in farm animals. And I don’t mean rummaging around in a big bin of tiny adorable chicks. I mean a cow. One cow. And the part of the cow you would least want your arm to be. As a rule of thumb, if on the first day of your new job you are handed a shoulder length plastic glove, look for a new job… Though I guess that’s more of a rule of shoulder. Frankly, the same usually goes for knee deep and, by extension, ankle deep. No one ever seems to ask you to immerse your extremities in something pleasant. By the same token, the good folks at Something Awful recently pointed out that, if you find it in a lair, you probably don’t want to meet it. Dragons have lairs. Super villains have lairs. You’ll never unwittingly stumble upon a fairy lair, or a cheerleader’s lair. Dens have the same bad reputation. Dens are always full of thieves, or tigers, or lions, or iniquity. And have you ever found a hive that you were happy to find? Sure, beehives are full of honey, but the are more notably filled with BEES. And bees travel in swarms, which is a mode of travel highly indicative of bad things as well. If there is a swarm heading toward you, run away. It isn’t going to be a swarm of kittens or clowns. … A swarm of clowns… I’m going to have nightmares about that one. And let’s not forget about colonies. You never want to be in a colony, regardless of the type. Ant colony, leper colony, penal colony. Hell, even the 13 colonies that eventually became this great nation of ours fought a war so they didn’t have to be colonies anymore. I’ve yet to hear about a massage colony. No, massages are found in parlors. That takes us into “inexplicably good” territory. Parlors get awesome things like massage, pizza, and tanning. The one oddball is the funeral parlor, thus preventing them from having a spotless reputation. Closer to the target is the basket. Chances are, if you find it in a basket, it is worth keeping. Puppies, fried shrimp, chicken fingers, easter goodies. Yep baskets are good times. Now, barrels on the other hand, I’m on the fence about. Evidently you can find monkeys in barrels, and they are supposedly quite entertaining in that format, though I’ll have to see it to believe it. Wine and crude oil both come in barrels too, and they are both good in moderation and when not spilled into a large body of water. Curiously, fish can be found in barrels, too, though if you are a fish, I’ve got some points I need to make. First off, congratulations on being in a barrel with an internet connection! Second, GET OUT THE BARREL! PEOPLE ARE GOING TO SHOOT YOU! Thus a barrel of fish is good for people with guns, bad for the fish. I’ll end this with the customary plea for comments. Some of you are out there with your arm deep in a vat of Reese’s Mini Peanut Butter Cups thinking, “This guy’s an idiot!” Others may be thinking, “I’m looking at a basket of tarantulas in a torture parlor that says you don’t know what you’re talking about.” Well, until you comment and let us know about it, I’m going to go on blissfully unaware that I’m wrong and you’re right! So let’s hear it, people!